There’s no point in beating about the bush with this one: Rogue Warrior is the worst game to come out during the seventh generation. Never has a game managed to fail on every level like Rebellion’s Cold War-era FPS, coming off as rushed despite actually being announced three years earlier in 2006. Very loosely based on real-life war hero Richard Marcinko, the only aspect that’s valiant about this lurid shooter is that it makes Conflict: Denied Ops look like Gears of War. Considering Rogue Warrior masqueraded as a full-price retail product, it’s unacceptable. Gamers take the role of real-life war veteran Richard Marcinko, played here by Mickey Rourke. Taking place in 1986, Marcinko and his comrades are sent on a classified mission into North Korea, though it quickly goes sour as his squad is killed by a patrol. The foul-mouthed soldier vows to complete the mission despite threats of court-martial and war between the US and the Soviet Union. You probably won’t care though, as the tensionless story is non-existent, with minimal cut-scenes that usually only feature Marcinko adding more coins to the swear jar. Considering how brisk the game is, it’s no wonder there isn't time to fully develop an interesting plot. 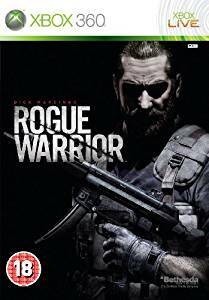 It’s immediately clear that Rogue Warrior is more akin to a budget title, despite it being a full price release. The opening cut-scene shows off the hideous graphics engine, with low-rent character models, bland lighting and an incompetent frame rate. Things don’t get much better during gameplay, with dull, rigidly linear levels, a narrow colour palette, repetitive enemies and lacklustre animation. Despite all of the above, the frame rate rarely can maintain thirty frames-per-second. Things hit an all-time low when you enter snow-bound levels, as mediocre particle effects turn the game into a slideshow, and it even causes difficulties while shooting. Not that, to be fair, the shooting is actually good to begin with. This is one of the most dull, tensionless shooters in recent memory, hampered even further by inconsistent collision detection and a poor cover system which switches to third-person, minus the precision with similar cover systems such as the one found in Rainbow Six Vegas. Abnormally idiotic A.I. ensures there’s never any semblance of challenge, as the red army opt to stand out in the open or glitch out altogether. Even on the hardest difficulty, most competent shooter fans will be able to breeze through Rogue Warrior’s campaign. And it’s just can’t be stressed how dull RW is to play, crafted while lacking any kind of finesse or care. Stealth elements cannot salvage any fun from this game either, allowing you to sneak up on troops and perform brutal stealth kills. You can also perform violent melee kills if you are in a gunfight, and this can become exploitive as the animation gives you temporary invincibility. The only interesting stealth moments come from where you can shoot out power boxes, and gain the upper hand in the dark using night-vision goggles, but these instances can be counted on one hand. Sometimes, it can feel like the game boils down to pressing a single button in order to progress, dwindling into a shallow exercise in violence. But, when you do have to shoot, the game is just as bad, as the aforementioned collision detection and A.I. issues rear their ugly head. At the end of the day, Rogue Warrior just isn’t much fun to play. Rogue Warrior is also blazingly short. You’ll notice that you’ve reached the mid-point after a mere hour of gameplay, and by the second or third hour, you’ll reach the credits (which, oddly, feature Mickey Rourke rapping). There’s no collectibles whatsoever, and very little reason to slog your way through the game after the first brisk run. Multiplayer fails to add any value either. With only two modes, frequent lag issues and a non-existent community, you probably won’t even touch the competitive part of this meagre package, meaning Rogue Warrior has some of the worst replay value ever seen. RW doesn’t have a lot going for it, with awful gameplay, dire graphics and very little gameplay time. The only element which stands out – albeit in a somewhat comical way - is the colossal swear count. Bearing in mind the brief runtime, it still manages to outdo other games for swearing, as if Marcinko has a bad case of Tourette syndrome. It borders on hilarious, as off-the-wall lines that add nothing to the story can give a chuckle. But, it becomes grating towards the end, because Rourke’s shallow performance adds little personality to Marcinko. Not even the addition of Neal McDonough can save the package. The rest of the sound design is weak, with lame gunfire, an uninteresting soundtrack and poorly recorded sound effects. Rogue Warrior is so bottom-of-the barrel, no amount of scraping can salvage it. But what’s more shocking is that RW is disguised as a full-priced retail release, not a budget game along the lines of The Sniper 2 or Skyscraper. In reality, there is no excuse for this level of shoddiness. Woefully ugly, a chore to play, and shorter than some Hollywood movies, it’s more offensive for its ineptitude than the massive swear count. It doesn’t matter how much you love shooters – do not touch this with a barge pole. "The only element which stands out – albeit in a somewhat comical way - is the colossal swear count. Woefully ugly, a chore to play, and shorter than some Hollywood movies... do not touch this with a barge pole."